It's that time of year again folks. The decorations are up and the weather is cold, meaning I am wearing a hat all the time... half because it's freezing, the other half because of my receding hairline that I have become increasingly more aware of during these past months. Can't stay a youthful online magazine editor forever, kids. Anyway, I was thinking that when it comes to video games Christmas doesn't really seem to be a thing. Perhaps it's because to make an entire game focused around a holiday that takes place during the space of one month of the year isn't really a good idea if you want your game to A) be remembered the entire year round when people have left the festivities behind or B) actually sell any other time of the year. While there aren't many games focused around Christmas and most that do exist are just crappy cash grabs, there are some games that don't focus on Christmas but include Christmas in some way. 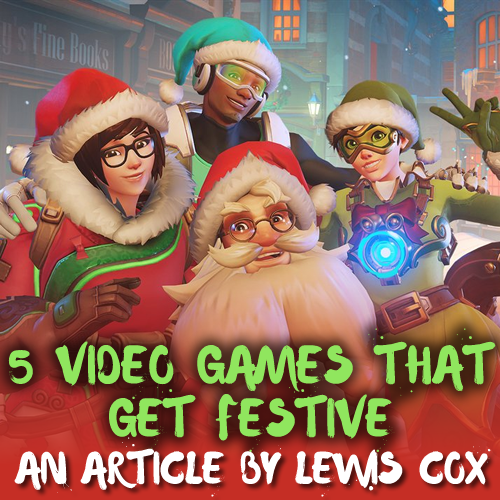 Here's a short list of some of the best that you can play as Christmas Day draws closer. So recently I got into Overwatch and I am really into it. Actually let me rephrase that: I am obsessed with Overwatch. Great gameplay that differs from your run-of-the-mill first person shooter and characters that are not only memorable but easy to fall in love with too. Sure, the competitive mode is unfair and disheartening, but when you play this game with friends it can be a lot of fun, and proper team work and coordination is always the key to a successful match. 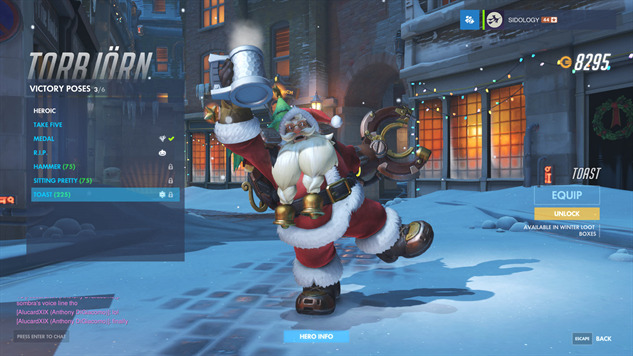 Well anyway, last Wednesday on all platforms they just released a special update for Christmas that gives some of the maps a snowy lick of paint, characters have cool Christmas-themed skins and voice lines, and there is a highly addictive and fun snowball fight mini-game featuring Mei. It's just a shame that all of the fun and Festivities only last until January, but we all know Blizzard will be sure to gift us with more of the same next year! If you, like me whenever I play through the first Shenmue game, always have to unlock the cutscenes where Nozomi confesses her love to protagonist Ryo Hazuki, you probably utilised the 'keep failing the quicktime event where Ryo has to catch the security guard's torch' trick to push the date of the game forward quickly. This is because the Nozomi cutscenes take place any night after the 25th. Get to Christmas time on the game and you will see decorations down Doubita Street, and even a Santa Claus walking around that you can talk to... and can't forget the Christmas-themed music in the classic Shenmue-style. 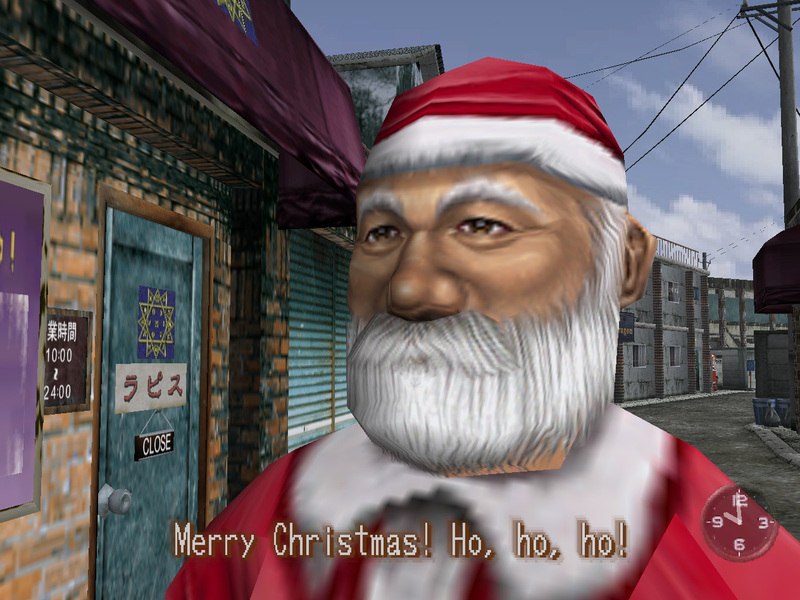 Shenmue was always an incredible game for atmosphere, even when it does Christmas in its own subtle way. Thank you Yu Suzuki. While the main game of NiGHTS into Dreams... doesn't feature Christmas, this two-level demo disc that was given away with the Sega Saturn magazine in the UK goes all out with the festivities - but only in December. Put this demo in your Sega Saturn any other time of year and it seems to be just a regular demo for the regular NiGHTS into Dreams... but when your Saturn console's clock reaches the month of Christmas, you are greeted with jolly Christmas music and the character of NiGHTS gets a red and white makeover. 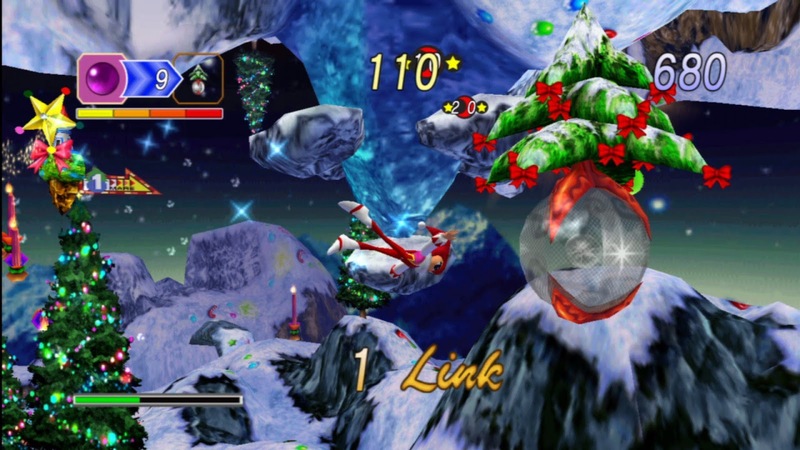 Jump into a game and snow is falling, the loops look like wreaths and sometimes you can even see Santa and his sleigh in the background scenery. 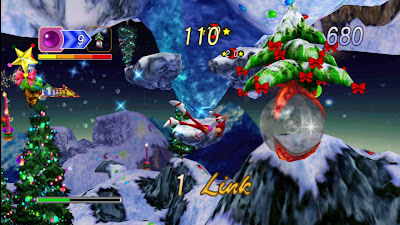 Beat one of the demo's two levels and you can play a matching puzzle to open presents that reward you with concept artwork and other goodies such as a device that checks the moods of the Nightopians in your main game, as well as being able to play one of the levels as Sonic in his first ever 3D appearance in a video game. If you don't have a Sega Saturn, I hear that they included this Christmas extra in the NiGHTS Into Dreams... remaster that is avaliable on PC, PS3 and Xbox 360 (as seen in the screenshot below). Ah, Bully.. or as we in the UK knew it, Canis Canem Edit. 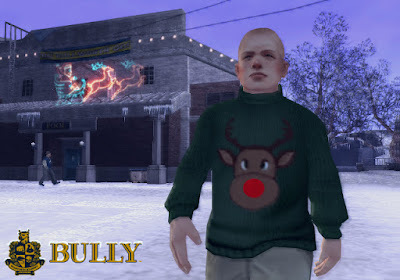 A fondly remembered yet widely misunderstood game in which the main story of the game is in fact focused around beating the bullies who pick on weak and vulnerable kids as opposed to actually bullying them at the academy that the main character Jimmy Hopkins attends (granted, you do have the ability to be a douche in the game if you do so wish). Anyway, after you go to sleep for the first time during Chapter 3, Jimmy awakens to an announcement calling him to the Principle's office. The grounds of Bullsworth Academy are covered in snow and Christmas decorations can be seen everywhere. At the Principle's office Jimmy receives a horrid Rudolph Christmas jumper from his neglectful mother that when worn causes kids around him to make fun of him. Change out of it quickly and leave the jeers and Christmas behind you as you move on with the story. I always felt this game also has a great atmosphere, and this little Christmas moment is a nice treat, especially since I remember some fond moments of watching my cousin play this game around Christmas time. This game is one I had as a kid that I will still vouch for nowadays as being an unexpectedly great movie tie-in, as was its sequel, which was also on the Game Boy Color. You can really tell that the developers went all out in attempting to capture the magical world of Harry Potter on Nintendo's handheld wonder, and they really pulled it off. There is just something to love about the simplistic yet detailed 8-bit environments of Hogwarts coupled together with some great exploration and RPG gameplay. Anyway, remember that bit in Harry Potter where Harry and Ron are about to open their Christmas and Peeves the ghost comes along and steals Harry's presents like the annoying twit he is? 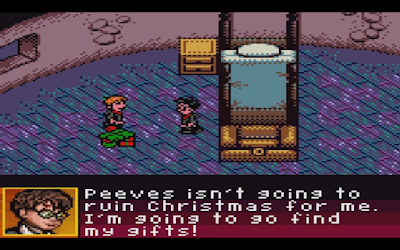 Okay, the developers had to take a few liberties with the story to keep the game lengthy but it's still cool that they tried to extend the Christmas part of the story, if just for a little while, without it just being limited to 'Harry and Ron opened their presents'. Instead you get to chase Peeves around an empty Hogwarts trying to find said presents. Now that I think about it, Hogwarts always seemed pretty lax on health and safety and what not, because if they cared about such things, surely they'd not have a giant three-headed dog chilling out in the third-floor corridor, lessons focused around digging up plant creatures with fatal cries and they'd restrain annoying ghosts trying to steal people's Christmas presents? I'm surprised Hogwarts wasn't shut down for endangering students... Merry Christmas! What games do you know love to play at Christmas get into the Festivities? Let us know in the comments section below, or via our Twitter or Facebook pages. Merry Christmas all you awesome Alt:Mag'ers, and thanks for reading!